During the Federal period in America, the increased focus on the home as a place for entertaining and leisure activities occasioned a demand for comfortable and attractive seating furniture. 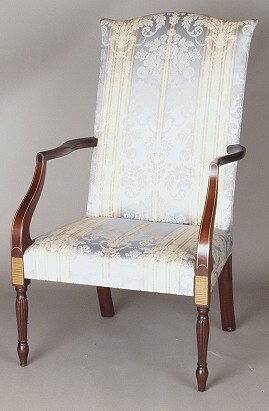 The low back upholstered open arm chair of the earlier Chippendale style was replaced by the high back Federal "lolling" chair which, as its name suggests, was used in parlors, libraries and other rooms in Federal American homes where relaxed, comfortable seating was needed. Our Sheraton Lolling Chair is an exact copy of a superb original which we owned several years ago. Made of select Honduras mahogany, this chair has a graceful peaked back with shaped arm rests above serpentine shaped and inlaid arm supports, in turn above inlaid maple panels and turned reeded legs ending in well formed bulbous feet. It is an example of an extremely rare form and represents the ultimate in quality and design. Fabric needed for upholstery is approx. 3 1/2 yds. depending on repeat.